Kurt Templin wonders, Friday, March 23, 2007, why the myth persists that Iran's president called for "Israel to be wiped off the map"
Did President Ahamdinejad ever threaten to "wipe Israel off the map"? "The Imam said this regime occupying Jerusalem must vanish from the page of time". That passage will mean nothing to most people, but one word might ring a bell: rezhim-e. It is the word "Regime", pronounced just like the English word with an extra "eh" sound at the end. 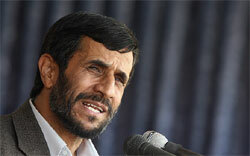 Ahmadinejad did not refer to Israel the country or Israel the land mass, but the Israeli regime. This is a vastly significant distinction, as one cannot wipe a regime off the map. Ahmadinejad does not even refer to Israel by name, he instead uses the specific phrase "rezhim-e ishghalgar-e qods" (regime occupying Jerusalem ). A word by word translation: Imam (Khomeini) ghoft (said) een (this) rezhim-e (regime) ishghalgar-e (occupying) qods ( Jerusalem ) bayad (must) az safheh-ye ruzgar (from page of time) mahv shavad (vanish from). So this raises the question.. what exactly did he want "wiped from the map"? The answer is: nothing. That's because the word "map" was never used. The Persian word for map, "nagsheh", is not contained anywhere in his original farsi quote, or, for that matter, anywhere in his entire speech. Nor was the western phrase "wipe out" ever said. Yet we are led to believe that Iran's President threatened to "wipe Israel off the map", despite never having uttered the words "map", "wipe out" or even "Israel". ON the leading edge of busting this myth [writes another reader, Friday, March 23, 2007] was University of Michigan Professor Juan Cole, who studies modern Middle Eastern history and has a very informative daily weblog.. Cole has been the "go-to" guy for sometime when wanting to understand the Middle East, and the hidden reasons for news events. For this and other postings not seen as "politically correct," he has become the target of many characters on the far right, and has even been branded with the "anti-semitic" label. Cole has joined other professors in a group dedicated to protecting one another from such charges, and defending real research and real scholarly work.